Experience an African “Big 5” safari and track endangered mountain gorillas in a new and exciting way! Rwanda and Tanzania Highlights safari, you will enjoy a big game safari in Tanzania’s top parks, including Ngorongoro Crater, Tarangire, and world-famous Serengeti. After getting a full dose of lions, zebras, giraffes, elephants and more, continue your adventure in the land of a thousand hills – Rwanda – where you’ll trek in misty mountain forests for the largest primates on earth. And if this wasn’t enough, you’ll also hike to Dian Fossey’s gravesite, take scenic tours and enjoy fascinating cultural interactions with traditional tribes. As sustainability is one of our benchmarks, your visit will include support to local charities and conservation programs. You’ll have private vehicles and guides throughout. The kicker? We’ve used all new or newly rebuilt camps and lodges in every location, so you’ll have great food and accommodations, too. No reviews yet for this trip. Browse other reviews below for Africa Adventure Consultants. On arrival at Kilimanjaro International Airport, you will be met and driven to the Kili Villa Lodge. Dinner and overnight here. After breakfast, drive to Tarangire National Park, famous for its elephant herds and huge baobab trees. Enjoy a picnic lunch and an afternoon game drive before heading to Kuro Camp. The range of activities at Kuro Camp is unique for a camp inside a Tanzanian National Park. Optional walking safaris (included) and night game drives (at an additional cost) add another unique wildlife viewing perspective that is hard to find in other parts of Tanzania. After breakfast, depart Kuro Camp and game drive through the park. Continue to Lake Manyara National Park for an afternoon game drive and picnic lunch. 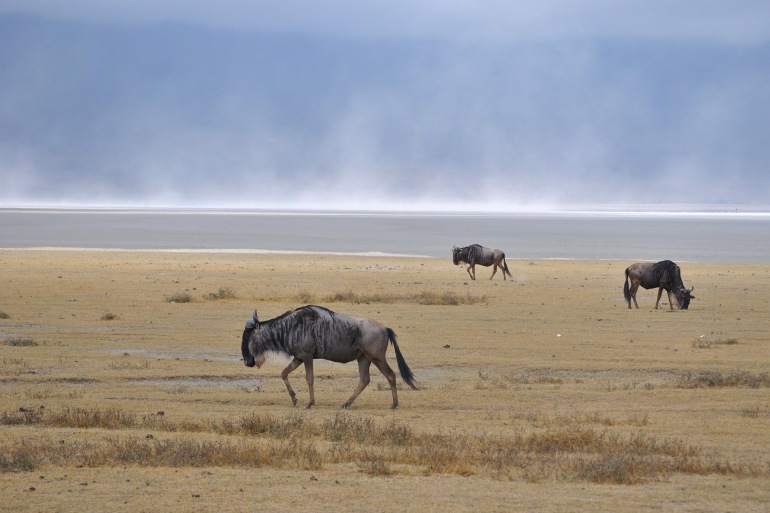 Lake Manyara is famous for tree-climbing lions, as well as the thousands of flamingos that make their annual pilgrimage to the shores of the shallow lake. Drive to The Castle at Ngorongoro for dinner and overnight. After breakfast, drive to the Ngorongoro Conservation Area and spend the day exploring the famous Ngorongoro Crater with a picnic lunch. This 100-square-mile caldera is home to more than 20,000 large mammals like lions, leopards, elephants, zebras, wildebeest and the rare black rhino. Dinner and overnight at The Castle at Ngorongoro. After breakfast, you will be met by a local representative and transferred to downtown Kigali for a city tour which includes the genocide memorial and craft centers. After lunch at a local restaurant (on your own account), drive north 2.5 hours through the Rwandan countryside to Ruhengeri at the foot of the Virunga Mountains. Arrive at Gorilla Mountain View Lodge for dinner and overnight. After an early breakfast, take a short drive to park headquarters and meet with excellent local guides and trackers who will give a talk on the etiquette of gorilla trekking (permit included, based on availability). You then hike into the forest where the gorillas were seen the night before and track from that point. The trekking can take from one to six hours and climb to altitudes in excess of 7,500 feet. The terrain is rough and at times muddy. Although the hike is physically demanding, the beauty of the forest and surrounding scenery make the trekking worthwhile. Once the gorillas are located, all fatigue is forgotten, as the experience is often described as being the most profound natural history experience in the world. It can rain at a moment’s notice; hence waterproof clothing is essential including, zip lock bags for cameras and film. In the afternoon following lunch, enjoy a tour of an ex-poacher’s village. Note: One hour is permitted with the gorillas per trek. Gorilla sightings cannot be guaranteed. The minimum age is 15 years old. Tracking through the forest can be steep, wet and slippery. Gorilla permits are subject to availability. After an early breakfast, return to the park headquarters where you will meet your guide for a trek to Dian Fossey’s grave (trek time: approx. 5-6 hours), which lies between Bisoke and Karisimbi volcanoes. Alternatively, opt for a second day of gorilla trekking (at an additional cost, based on permit availability). Following lunch at your lodge, enjoy a visit to twin lakes Burera and Ruhundo. Return to your lodge for dinner. Overnight Gorilla Mountain View Lodge. After breakfast, transfer to the Kigali airport for your onward flights.